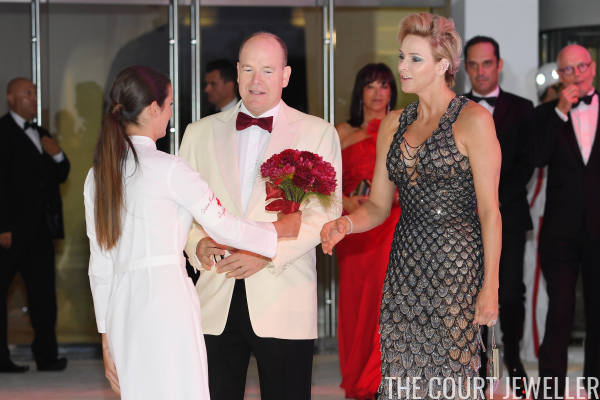 This weekend, the Prince and Princess of Monaco headed to the Sporting Club in Monte Carlo for one of the principality's biggest events of the summer: the Red Cross Gala. This year was the 70th anniversary for the charity event. 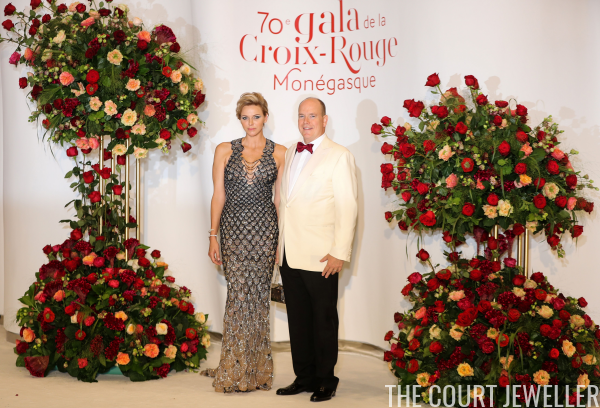 Charlene sparkled from head to toe for the gala. She wore simple diamond studs in her lobes, but she also added an elaborate diamond cuff ornament on her left ear. The diamond stud was the only adornment on her right ear. On her right wrist, Charlene balanced her jewelry by wearing a twisting diamond bracelet. Charlene's stunning engagement ring was her other major accessory. This view also gives you a good look at the stunning beading on her gown. And here's a look at the entire ensemble -- a modern gown with a vintage feel and a mermaid vibe.